Pass the Security+ exam the first time you take it with the CompTIA Security+: Get Certified Get Ahead: SY0-401 Study Guide. The author uses many of the same analogies and explanations he’s honed in the classroom. These analogies an explanations have helped hundreds of students master the Security+ content. You’ll be ready to take and pass the exam the first time you take it. Each chapter includes a comprehensive review section to help you focus on what’s important. Over 400 realistic practice test questions with in-depth explanations will help you test your comprehension and readiness for the exam. Includes a 100 question pre-test, a 100 question post-test, and practice test questions at the end of every chapter. Each practice test question includes a detailed explanation to help you understand the content and the reasoning behind the question. This course includes all of the multiple-choice practice test questions, performance-based questions, audio, and flashcards from the Security+ Full Access package but adds the CompTIA Security+: Get Certified Get Ahead: SY0-401 Study Guide within an online course. Random practice tests from the all of the practice test questions in the CompTIA Security+: Get Certified Get Ahead: SY0-401 Study Guide. All questions include explanations so you'll know why the correct answers are correct, and why the incorrect answers are incorrect. See a demo here. Use these to reaffirm your understanding of the content in the book before taking the live exam. Extra Test Bank of Practice Test Questions At least 48 new multiple-choice questions in the extra test bank. Questions are added occasionally. You can see what has been added recently here. 34 Simulated Performance-based Questions Eight sets of performance-based questions with multiple questions in each set. These questions help you understand and prepare for performance based questions. 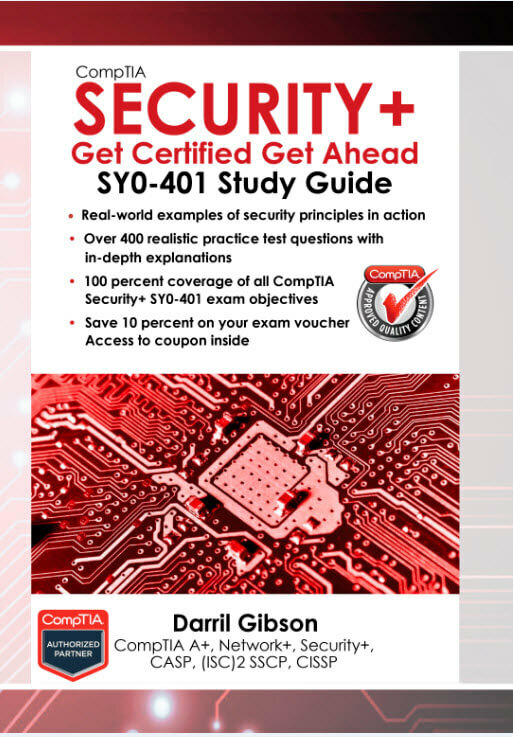 Bonus #1 Audio from the end of chapter reviews from each of the chapters in the CompTIA Security+: Get Certified Get Ahead: SY0-401 Study Guide . Over one hour and 15 minutes of additional audio. Make sure you're ready before exam day! Our online Security+ study materials are the perfect complement to the CompTIA Security+: Get Certified Get Ahead: SY0-401 Study Guide. They can also be used to help ensure you're ready no matter what study guide you're using. All questions include explanations so you'll know why the correct answers are correct, and why the incorrect answers are incorrect. These questions are derived from and organized by chapters in the CompTIA Security+ Get Certified Get Ahead: SY0-401 Study Guide . 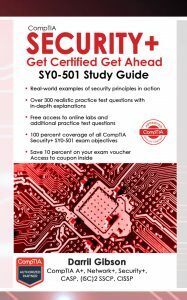 All of the multiple-choice questions from the best-selling CompTIA Security+: Get Certified Get Ahead: SY0-401 Study Guide. See a demo here. All questions have full explanations so you'll know why the correct answers are correct and why the incorrect answers are incorrect. Over 48 new multiple-choice questions we've added after publishing the study guide. Over 70 performance-based questions. See a demo here. A subnetting mini-tutorial to help you answer key question types in the Security+ exam. Access to a free discount code for 10% off your Security+ voucher. Save $31.10 off the US retail cost for this voucher. Supplement your studies with Security+ audio files read directly from the CompTIA Security+ Get Certified Get Ahead SY0-401 book. A total of over 4 hours and 40 minutes are now available. Supplement your studies with Security+ audio files you can listen to while on the go. Listen to key topics from all the chapters of the top selling CompTIA Security+: Get Certified Get Ahead: SY0-401 Study Guide, or focus on just the topics you want to brush up on. Listen on your iPod or MP3 player. Note that these audio files are not the book which could easily be forty hours of listening time. Instead, they focus on key information to supplement your studies. Includes the full book introduction, and Remember This blocks from each of the 11 chapters. The Remember This blocks highlight key testable information. Listening to these files will help you reaffirm key testable concepts. 12 MP3 files zipped to about 71 MB in size. Includes the full book introduction, and all of the practice test questions at the end of each of the 11 chapters. 12 MP3 files zipped to about 175 MB in size. All audio files are included in the Security+ Full Access Package. Free sample from chapter 8 available here. This audio sample includes the Remember This blocks from chapter 8 which are key topics to know for the exam. All audio files read directly from the CompTIA Security+: Get Certified Get Ahead: SY0-401 Study Guide by a professional voice actor. 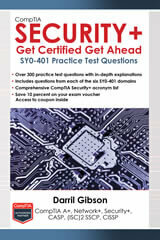 Check your readiness for the Security+ exam with the CompTIA Security+ SY0-401 Practice Test Questions (Get Certified Get Ahead) book. Available in both paperback and Kindle format. Includes over300 realistic practice test questions with in-depth explanations so that you’ll know why the correct answers are correct, and why the incorrect answers are incorrect. Kindle edition includes dozens of flash cards specifically formatted for the Kindle. Practice test questions without answers. Created for readers that want to go through all the questions without seeing the correct answers or explanations. Practice test questions including answers formatted for the Kindle. One Kindle screen shows the question. When you decide what you think is the correct answer, go to the next Kindle screen to see the correct answer. Each question includes an in-depth explanation so you’ll know why the correct answers are correct, and why the incorrect answers are incorrect. Flash cards formatted specifically for the Kindle to help reinforce important concepts. One Kindle screen shows a flash card type question and the next Kindle screen shows the answer.The introduction includes details on the exam to give you an idea of what to expect. Additionally, the acronym list at the end of the book provides relevant details on many of the acronyms referenced in the Security+ exam. 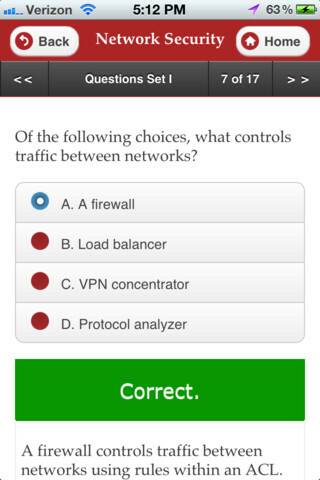 Practice test questions for your mobile devices. Learnzapp has apps for a wide assortment of mobile devices including Apple, Android, Amazon, Nook, and Blackberry. In-depth coverage of all six domains in the CompTIA Security+ SY0-401 exam. App includes realistic practice questions to help you assess your exam readiness. Flashcards to help you review important testable concepts. Buy once. Use on any device. Amazing interactive user experience. Internet connection not required.